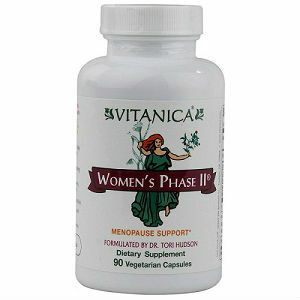 This pure botanical menopause symptom relief formula is a Vitanica’s flagship product. The vendor is especially proud of Women’s Phase II because this formulation proved effective in a double blind placebo controlled trial conducted at two naturopathic colleges. No ingredient amount measurements are provided in the product source. No information is provided in the product source about daily dosage. The vendor source contains no price information. The product is available in 90 and 180 capsule containers and can be purchased on line or from a network of local dealers. The product source provides no information on product guarantees or returns but does contain a contact phone number as well as a store locator tool (the link to this tool did not work when tried however). Given the limited information provided in the product source makes it difficult to recommend this product. Anyone seeking to purchase this product should locate and contact a dealer in their area for more information as a first step. Jackie Horowitz	reviewed Vitanica	on April 13th	 and gave it a rating of 2.